One of our most popular recipes, our turkey & chicken recipe is paws down a culinary masterpiece for cats of all shapes and sizes. Contains NO grains, carrageenan, meat by-products, corn, wheat, soy or artificial preservatives, colors or flavoring. AVAILABLE IN 5.5 OZ & 12.5 OZ CANS. Turkey, Chicken, Turkey Liver, Turkey Broth, Tuna, Natural Flavor, Guar Gum, Potassium Chloride, Agar Agar, Choline Chloride, Taurine, Cranberries, Pumpkin, Menhaden Fish Oil (Preserved With Mixed Tocopherols), Tomato, Dried Kelp, Yucca Schidigera Extract, Salt, Iron Proteinate, Sodium Carbonate, Zinc Proteinate, Thiamine Mononitrate, Vitamin E Supplement, Magnesium Sulfate, Copper Proteinate, Manganese Proteinate, Sodium Selenite, Niacin Supplement, d-Calcium Pantothenate, Pyridoxine Hydrochloride, Riboflavin Supplement, Vitamin A Supplement, Biotin, Potassium Iodide, Vitamin D3 Supplement, Vitamin B12 Supplement, Folic Acid, Rosemary Extract. 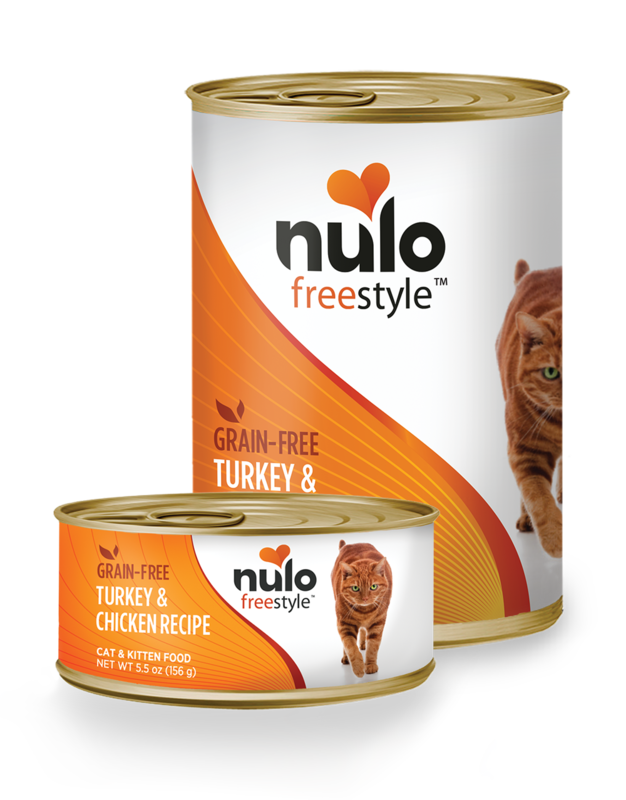 FreeStyle Cat & Kitten Turkey & Chicken Recipe is formulated to meet the nutritional levels established by the AAFCO Cat Food Nutrient Profiles for all lifestages. Feed at room temperature and refrigerate unused portion. Your cat should always have access to clean fresh water. 5.5 oz Adult: feed 1 can per 6-8 lbs. of body weight per day. Kitten: feed up to twice the adult amount to kittens. Gestation and lactation: feed up to 3 times the normal adult amount. 12.5 oz Adult: feed ½ can per 6-8 lbs. of body weight per day. Kitten: feed up to twice the adult amount to kittens. Gestation and lactation: feed up to 3 times the normal adult amount.